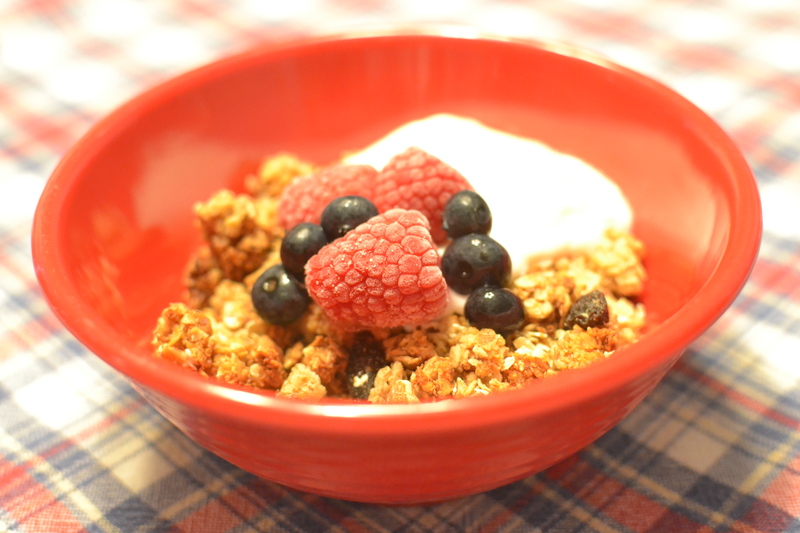 Granola – I ate this bowl of granola for my breakfast right after I took the picture. It was delicious! Since it is “back to school” time for a lot of families, I was thinking about how breakfast sometimes has to be done in a hurry. When I was eating my favorite quick breakfast the other day, I thought about how I should share this great recipe with all of you. This one, like the zucchini bread and the raspberry pie, is a bonus recipe because it does not come from my grandmother’s recipe box. My good friend Linda gave me this recipe last summer. She got it from her sister, also my good friend, Laurel. 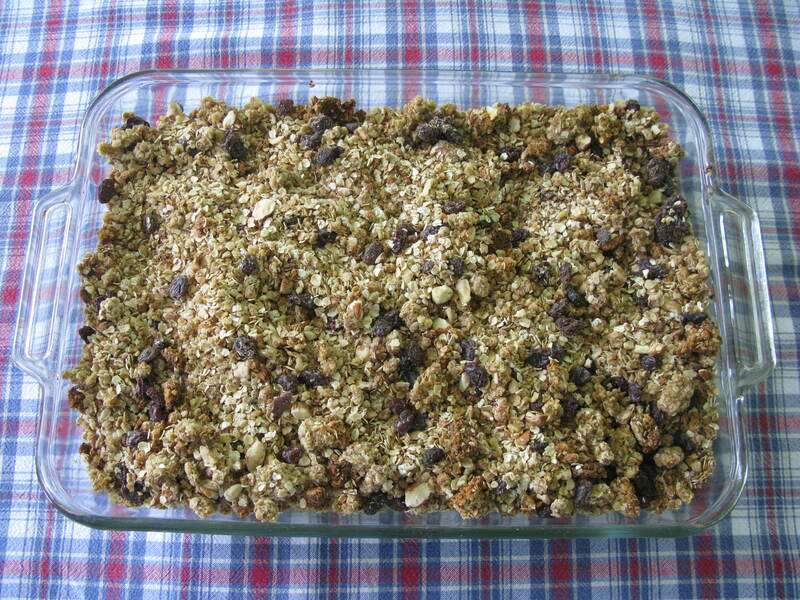 I have made a lot of different granola recipes, but once I was given this one, I don’t deviate from it very often. In fact, I often double it because it can be stored in the refrigerator for up to two weeks or in the freezer for even longer. And, as soon as it is gone, it is not long before I am stirring up another batch. Combine dry ingredients and wet ingredients separately Mix wet into dry and then spread out on a jelly roll pan. Bake at 350 for 40-50 minutes, stirring after 30 minutes and then every 7-8 minutes until beginning to brown. Cool on counter and then place in fridge for 2-3 weeks. This is also delicious with dried cherries, cranberries or raisins. Granola cooling in the pan. One of the nice things about this recipe is how you can change it to suit your tastes or what you have on hand. I usually use 1/2 cup of flax seed meal and 1/2 cup of wheat germ in place of the sunflower and pumpkin seeds because that is what I have. I also lower the maple syrup to 1/4 cup so I am eating less sugar and it still tastes great. I also use whatever nuts I have on hand at the time. It is so simple to put together. I usually top it with yogurt and fresh fruit. 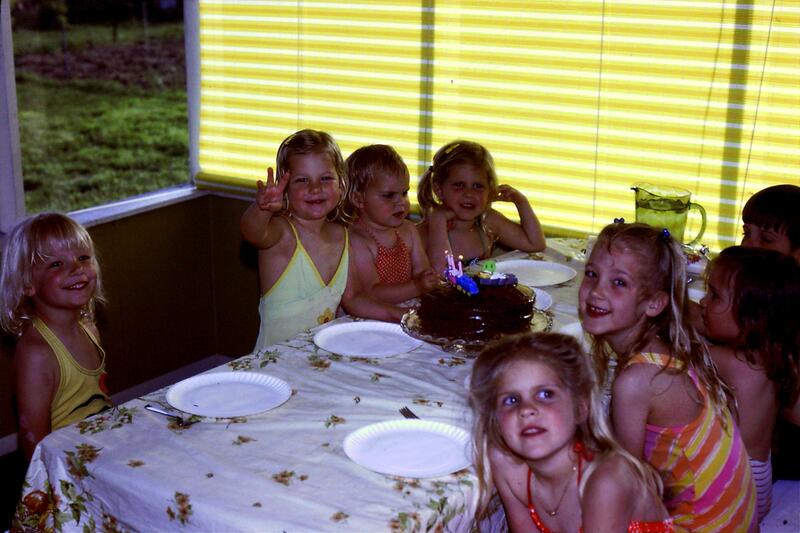 Childhood birthday part with Linda, Laurel and Beth and our friends Sarah and Michael. Linda, Laurel and their sister Beth were some of my sisters, brother and my best childhood friends. In fact, they are more than childhood friends – they are our forever friends because we love them still and feel like we are with family whenever we are with them. Thank you for the great recipe girls! This entry was posted in bonus recipe, Breakfast, oatmeal, Snacks and tagged Almonds, baking, Breakfast, Cashews, Dried Cherries, Dried Cranberries, farm cooking, grandma's cooking, Granola, homemade, Maple Syrup, Pumpkin Seeds, Raisins, scratch cooking, Sunflower Seeds, walnuts by GrandmothersRecipeBox. Bookmark the permalink. Love love love! Great recipe. Great memories. Thanks for sharing. Thank you for the recipe, Linda! You’ve changed how we eat granola for life! I think of you and Laurel every time I make it!